Get these cute head bands through purchasing 1,000Ameba Gold from December 28 to January 4! Aren't they cute? I know most of you love bears! So don't miss it! Remember, it's LIMITED! [AG Campaign] Teddy Bear Headband! Tonight, we celebrated Christmas with our friends. First, we had a food party inside my room. I flooded my room with foods and I was all in rush that time! It was quite hard for me because my pico was very laggy . After eating in my room, we went in Chloe's house and take a picture under the big Christmas Tree. It was so lag and it made everyone white and naked. It's quite funny because it reminds me of hot spring in japan. All naked.XD So I had to go back in to my room to refresh the server of Chloe's house and I went back. I actually waited 3 people and it took me time before entering. Merry Christmas & Happy New Year to everyone! Our friends, fans, supporters, blog readers, youtube watchers and more! It's been a long time since the last time I online and I was surprised to see these! After getting busy in real with my daily dance practices for Winter festival in our place and finally the actual had come and I'm done! These past few days I really had a small time to play this game : ( I missed it so much! And I feel so happy after getting 107 messages on my board. 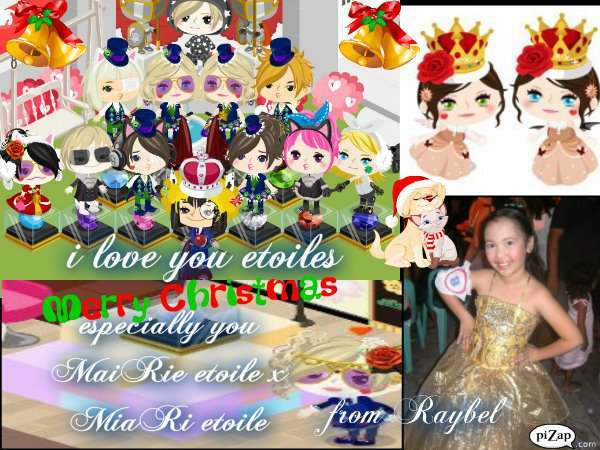 Tho, I can't see all, specially the old ones :< Well, most of them are Christmas greetings for me and Étoiles. Thank you guys! Sacred Hall is finally decorated for Christmas! I more feel the essence and presence of Christmas this way! 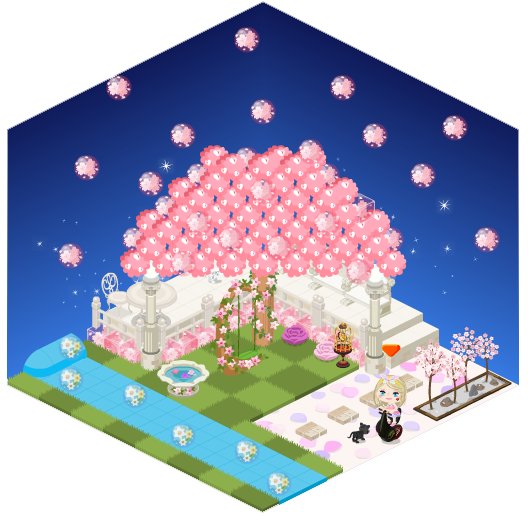 And I really love the new gacha, specially the Angel Wings!♥ Chck the items out and don't miss them okay? [AREA] Sacred Hall is Christmas Decorated! The 6th Edition cover of Pico model's Magazine for this year's Christmas, the cover is finally released! Yesterday, our friend Libby, the head of Pico Model uploaded the latest cover of their magazine/page. Though we don't know why there is no other pages other than this. In case we have new information, we will be updating you again! MaiRie isn't just "Dr. MaiRie"
Last Year's Christmas items are back! Waaaah, I really love to reminiscence past memories! Saw the latest information from Official Ameba Blog? Yes! It's the [GACHA] Santa Gothic Gacha is in NYC! Another Casino Challenge is here around! Casino Pop Celeb Challenge! Get the colorful luxurious Pop Celebrity outfit in casino now! Just finish the challenge and get the cool items! New York City Down Town finally decorated in Christmas version plus new items that you can buy from shops in down town! Check out the new clothes for this year's Christmas! Soon, last year's Christmas items will be release as well so, don't miss it! New Chritmas Gifts for this year! Also, don't miss the upcoming 2010's Christmas items! Don't miss on collecting the gifts and get cool items only available for this year's Christmas season. These items are limited 100%! So don't miss your change to get them! Buy 3 gifts and get a White Christmas tree! And get the gifts inside the box on Christmas!! Isn't exiting? Well, if you want some ideas about the fit inside, take a look at this. Also, last year's Christmas Gacha is back as well! The GM gacha was also changed into Chritsmas Version so, don't miss the cool items from it! We will be making another guide soon and we hope it could help! [Area] NY Downtown is Christmas Decorated! Hello everyone! I would like to share my new room design! Mai and I have been planning for this since she started Alice in Wonderland room. Remember our picture being the cast of Alice in Wonderland with other Étoiles long time ago from "Alice in Wonderland in Pico" blog post. Me as White Queen while Mai is the Red Queen( Queen of Hearts). Well, finally! Our dream came true! I just re-designed my room from Étoile Sea to Alice in Wonderland's White Queen's Place! Actually, it's not yet finish. My family visited me while I was fixing my room and so, we took a picture together with Yamamoto 85! I've been collecting the messages I'm receiving ever since. I'm really happy to read their letters/messages to me,, cheering me up and making me more inspired. I wanna keep all these messages, treasure them so that even I am not playing pico anymore(if ever... cuz I know I will not be playing this game forever) I could remember the warm love they are showing me and I'm proud to share these to everyone. Besides, I want to remember each picos who have been supporting me, my sis, my pico family, our videos and more! Thank you very much everyone!! Have you heard about the 5th Casino challenge? Well, this challenge started yesterday and the slots were really full again! Congratulations to Eric Étoile for having the limited item! This picture was takin in his room. Oh well, I really love the veil, specially my twin, Mai. She wears it everywhere right now and she doesn't want to take it off her head. Lol. Well, don't miss the x7 per spin! This campaign would really help us to earn more C$ to save for your dream casino items! So don't miss the cool Arabian items!!! Another Étoile birthday celebrant for today!!! All of online Étoiles went to his room and greeted him a happy birthday with our friends and greeted him in his message board in his room. It's been a while since Anna onlined! I rushed out to her room when I saw the notice and hurriedly say "hi" to her. I was afraid she got dc and can't able to play pico because of low internet connection or something so yeah! I missed my daughter! Then I called Étoiles for them to see Anna and I also introduced Nayumi for being one of the new Étoile Nobles. We took a pictures inside her room. And then I called our friends and other people who haven't met her and it was fun inside her house. They thought me on how to speak in bahasa and I got really confused. I'm still doing my best on remembering the words. And then we had shopping at Christmas Park with Anna. Then after, I have to go because I have other things to work on and Anna have to do her works in university. Today is one of Étoile's birthday, it's Sora! He rarely online because he is busy in real life due with his personal reason but still, ge gets online when he is free. We weren't ale to celebrate it with him because I was busy for my exam and other stuffs and I didn had enough time to bond with him. 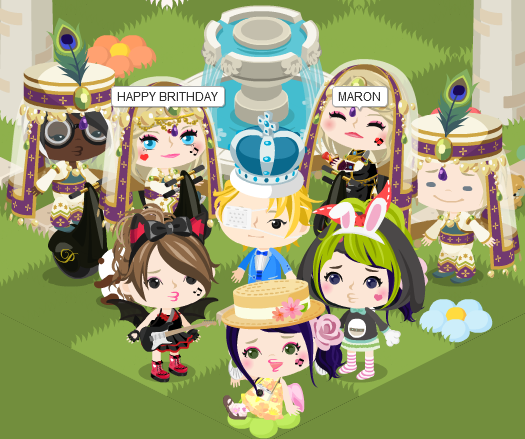 But I am willing to celebrate his birthday soon when we get online and met on pico even though its late! I really love this guy and he helped me a lot. He's one of my best buds on pico and it made me miss him more! Waaaa!!! So let's greet him a Happy Birthday on his room board! Hello everyone! To all picos who are very active on visiting the hot 30 rooms, to all who's in hot 30 as well. I know everyone of you are aware about the issue about the decrease of the number of favorites per room in hot 30. I think this is really serious because Ethan, who's in hot 1 is being accused by many for hacking the faves of other rooms. Well, are you sure about this rumor? I talked to Ethan last month, November 27 that someone is hacking his faves and its tiring to put them back. I, my self doesn't know how to help him because there are so many picos who know the fave cheat and I'm really aware of that because the number of hackings and cheating are increasing. 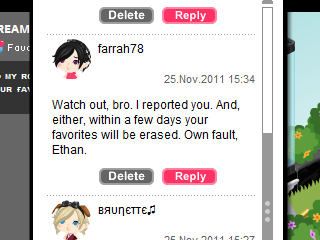 Ethan showed me a message from someone who's hacking his room faves and blaming him w/o any reason. Please take a look on the picture below. This pico user was the one who's suspected on hacking Ethan's room faves and probably who hacked everyone's fave. That's why, I don't believe with the rumors w/o any proof because I think it is the lamest thing ever. And it's really sad to say that it's hard to find out who's in fault because of numbers of hackers and cheaters as well as the numbers of picos who get online everyday and its hard to get proofs unless the hacker admitted it him/herself. So please stop blaming someone regarding this issue. You should be aware of someone's feeling. Don't believe things you heard because it is said by or friend, close friend, best friend or family in pico because there is no proof. For now, even it's like it is hope less to hear,.. we should just get over it and accept what it is and how it is now. This post isn't really for Ethan because we are friends but the purpose of this is that, I'm telling just everyone to stop the non-sense rumors. And I am saying this because, I was accused once. Please put down your pride and widen your understanding. Thank you. Thank you very much for the balloons! I just entered hot 1 today and I was surprised when I checked my rooms and the 4th room is already filled pf balloons. I cant even see my face and click somewhere because the balloons will be activated if I click wrongly. Thank you very much for the love and support! I'm pretty sure that these balloons will be hard to delete! hahaha! Please keep on supporting Alice in Wonderland! Feel free to visit my room every time, anytime and anywhere! 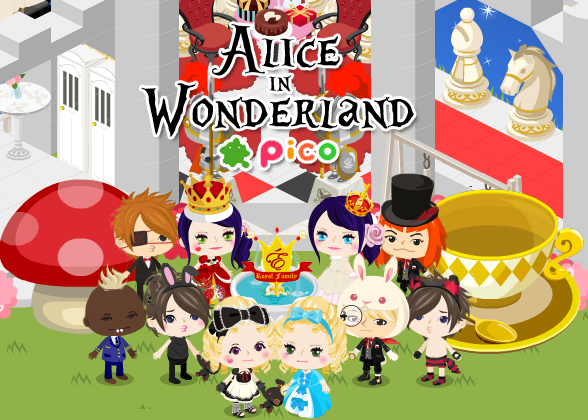 We are inviting everyone to gather till the last minute of Ameba Pico! We will be having special events as a count down! So don''t miss out the last chance to be with us at É's Royal Grand Graduation. A new Pet trick was added to the collection! Check out now the tiger's complete tricks HERE. 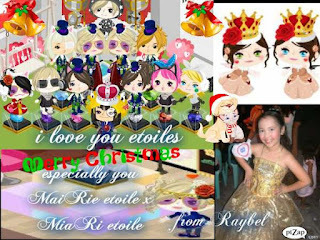 http://etoile-sisters.blogspot.jp/2012/02/pet-tricks-collection.html Pico is shutting down soon but this isn't the end yet! Add us on PIGG! 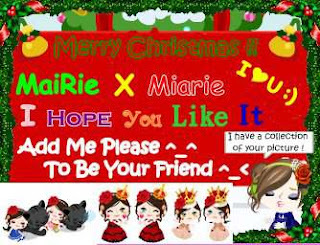 Keep in touch through Facebook/Twitter with Mai NOW! Keep in touch through Facebook with Mia NOW! Our Old Page Was deleted by facebook. So please help us get back our 5,000 Likes!